Moving with children can be a very emotional process, especially for moves that will significantly affect their lives (i.e. changing schools). Younger children tend to have a trickier time coping with the idea of a move and may not completely understand what’s going on. The mixed emotions that come with moving make communication and reassurance paramount during a move with children, but that doesn’t mean they can’t lend a helping hand! In fact, getting your kids to pitch in can help them better cope with the move itself. Involving your children in the storage and moving process speeds up the packing/unpacking progress, offers a bit of a distraction to worried youngsters, and puts a positive spin on an event that they may feel unsure about. As a parent, it’s easy to become so focused on the big picture when it comes to portable storage and moving that your kids might feel left out of this very monumental time in their lives. Here are 8 ways you can involve your kids in the portable storage and moving process, even if your children are younger than grade school. Whether your kids have yet to see the new place or not, spending some time giving them a “house tour” without the realtor or some other distraction there introduces them to their future home in a more intimate way. Your kids will likely have questions about the house, what rooms are for what, and where their new bedrooms will be. This gives you a chance to answer their questions and have a game plan for how the home will be set up before you start unpacking. Also – if you have young kids, this initial walkthrough is the perfect time to start childproofing. This gives you a chance to start putting locks on cabinets, baby gates in certain doorways, and other tasks that will give you peace of mind when you’re busy unpacking. Once your kids have seen their new bedrooms, it’s a great idea to encourage them to map out how they’d like their new bedroom to be set up. Grab a piece of paper and draw a rough sketch of the bedroom. It doesn’t have to be an accurate blueprint, but rather a general outline of the space. They can then fill in the blanks and get an idea of how they might like their new bedroom to look. This is a great trick for kids that might not feel excited about the changes that come with moving. By mapping out their new bedroom it gives them a general idea of how it will look once you’re done unpacking and reassures them that their new bedroom won’t feel like a strange place those first few nights. Visiting the office supply store for packing supplies is likely on your errand list for any storage and moving activity. Rather than leaving the kids at home, take them along and have them help pick out supplies. With some guidance from you, let them pick out tape, stickers/labels, markers, and other supplies that will be used for packing boxes for storage and moving. Encourage them to pick out different colors, which will come in handy for color-coding boxes later on. Remember to double-check the supplies your kids pick out. For example, permanent markers might be fine for older kids and teens, but could turn into a mess for young children! Decluttering your kids’ rooms should be done while packing for storage or moving. Since everything needs to be moved anyways, it’s a great opportunity to get rid of old toys and other items that they no longer need. Mark a bin or large box as ‘Donate’ and have your kids place toys they no longer want there. If you find they’re having a hard time parting with toys, consider enacting a rule of “keep two, donate one”. Younger kids might feel worried about donating toys and other items because they think that all of their toys are being thrown away. Reassure them that this isn’t what’s happening and maybe even let them keep a few of their prized toys in a separate bin. They can keep this bin with them and that can help them feel more confident about the other boxes being placed in the portable moving and storage containers. You can pack boxes more quickly by having some family members focused on packing while others tape up the boxes. A great idea is to have the adults and teens pack boxes while the older kids focus on taping up the boxes. Keep in mind that packing tape dispensers can have a sharp cutting edge on them. These dispensers should only be used by kids old enough to safely handle them. If you are concerned, having kids use the rolls of tape by hand is a very safe alternative and might even be faster for them. Labeling boxes makes unpacking portable moving and storage containers much easier, even though it can be tempting to skip this step. While you might consider labeling boring, it can be quite fun for your kids! Younger kids can do a great job at labeling boxes. Even if they can’t write legibly, you can simply use a color-coding system. For example, all bathroom boxes will be labeled with blue tape or stickers while the kitchen boxes will be labeled with red. Another idea is to purchase or make labels with each room name already written. Simply swipe over each room name with a different color and have your kids stick them on the boxes. Decorating your moving and storage containers can also be a welcome distraction for kids if you’re finding yourself short on time. Letting their inner Picassos go to work while you focus on other tasks keeps them feeling involved in the moving process and having fun. A big part of moving is sorting through the fridge, freezers, and pantry. This task can easily be delegated to any kids old enough to read expiration dates. Set them up with a big garbage can and have them throw away any old food in the fridge and freezer, freezer-burnt foods, and any items in the pantry that are past expiration. You can also have them wipe down shelves and cabinets with kid-safe cleaning supplies or wipes while they do this to kill two birds with one stone. If your kids are too young to do this on your own, you might work with them together to keep them involved. You check the dates and they throw it in the trash. Aside from moving and storage containers, packing an ‘Essentials Bags’ for everyone in the family is important. These bags should have any items needed for the first night in your new home – such as toothbrushes, change of clothes and PJs, bedtime toys/comfort items, etc. If you have a family with mixed-age kids (young and older), you can have them focus on packing these bags. Create a checklist for the older kids to follow and have them work together to gather them. This can even feel like a bit of a scavenger hunt. Be sure to do a quick double-check over these bags just to make sure all the most important items are indeed there. Moving with kids doesn’t have to be a stressful experience. With proper planning and using the featured tips to get your kids involved, you just might find that your children make the move into your new home that much more exciting for the entire family. 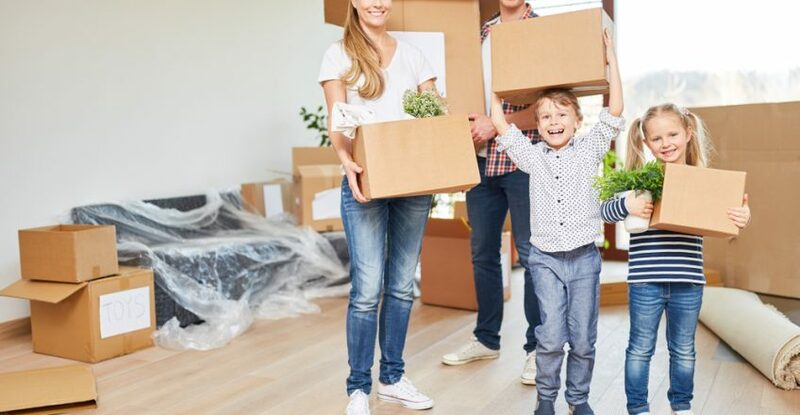 Being a family-owned business, Cool Box Portable Storage and Moving is all about making relocation an easier experience for families with kids. Cool Box also looks out for families by giving their customers plenty of time for packing and unpacking their portable storage and moving units. In comparison with other moving services, Cool Box gives you as much time as you need, in addition to offering four free movements if you live within 30 miles of their facility. Cool Box’s portable moving and storage containers are a safer option for kids to be around compared to moving trucks. This is because of Cool Box moving and storage containers being placed at ground-level. There are no ramps or lifts to worry about – which are both significant hazard concerns when children are around. Cool Box portable storage and moving units are also insulated, which keeps the interior 10F to 15F cooler in the summer and warmer in the winter. Moving is already an expensive process so saving money wherever possible is an important factor for many families. If you receive a quote for a lower rate from another portable storage and moving service for the same size unit and length of rental that Cool Box offers, they’ll give you the same price or one lower. 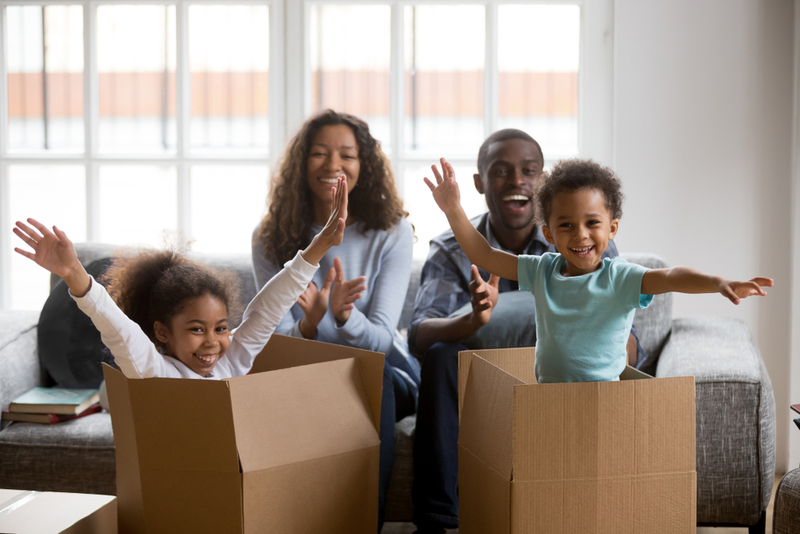 When you’re preparing to move your family into a new home, Cool Box Storage and Moving is ready to help you out. For more information on Cool Box Portable Storage, visit their website and blog. Already have a moving date in mind? Take the first step to renting one of Cool Box’s portable storage and moving containers by filling out the Instant Online Quote form or get in touch with a customer service rep directly.